Are you traveling to Central Florida looking for new ways to spend time in the outdoors? Are you looking for a break from the theme parks? Take your family on a fishing adventure that you will not forget. Just a short drive south, you can be on one of the best lakes to fish for largemouth bass in the state of Florida. Our local experts will take care of all your needs on this trip all you have to do is step aboard. 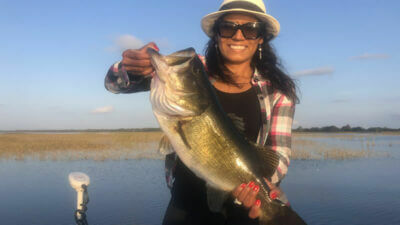 Enjoy an amazing Kissimmee bass fishing charter on your next vacation to Central Florida. Lake Toho in Kissimmee, FL is a beautiful place to get on the water. The natural wildlife allows you to experience the true power of the Florida Outdoors. Our local experts have years of experience fishing this beautiful lake. They know when, how, and where to catch big largemouth bass. When you are looking for an adventure, these are the guides you want to get on the water with. Captain Steve Niemoeller had the pleasure of fishing with Greg and his wife Carly. They were traveling to Florida from Iowa looking to spend some time in the sun. While here on vacation, they wanted to get out on the water and catch some largemouth bass. Luckily for them, the bass fishing has been fantastic and the fish were biting. Greg and Carly caught numbers of largemouth bass on their fishing trip. The biggest fish weighed in at 5 pounds. Greg also caught some quality bass to weighing up to 4 pounds. The action is strong on this amazing lake. Water temperatures are just right for some incredible fishing in the upcoming weeks. Greg and Carly had a great time fishing with Captain Steve. They will be back for more action in the near future! Captain Steve is looking forward to their next adventure on the water!! great outdoors. 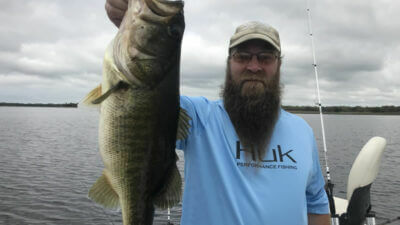 Lake Toho Bass Fishing was an exceptional fit and it showed him a great time on his 8-hour fishing trip. Yet again, wild-caught live shiners were the productive technique. 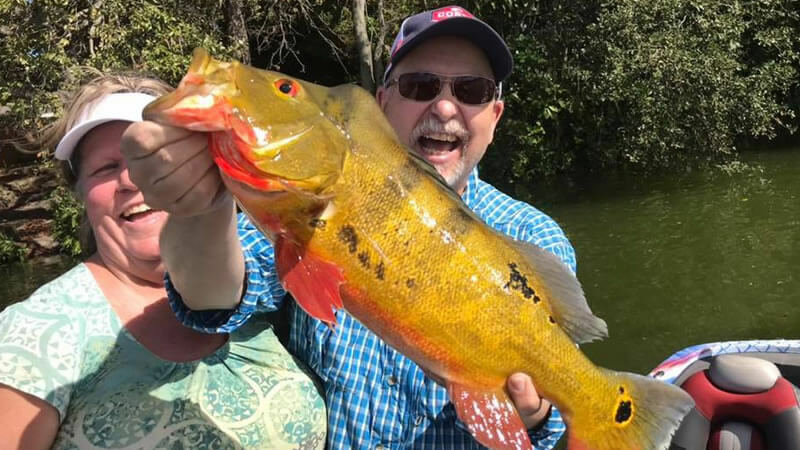 Lake Toho is infamous for trolling shiners along weed line and submerged hydrilla. 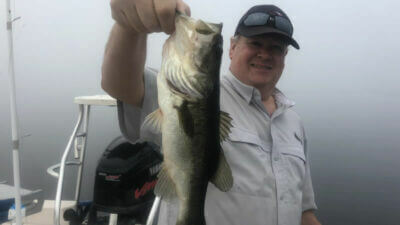 Dave caught over 50 Florida largemouth bass on this fishing trip. The average fish weighed in at 3.5 pounds. Dave caught 10 bass over 5 pounds with the biggest fish weighing in at 6.5 pounds. Dave is looking forward to his next adventure on Lake Toho. We got him addicted to bass fishing in Central Florida. Captain Devin is looking forward to fishing with Dave again in the near future! Soon after this awesome fishing adventure, Captain Brent explored the waters of Lake Toho. He had the pleasure of spending a full day with a morning and an afternoon fishing charter. On his morning fishing trip, he had the pleasure of fishing with Phil and his good friend Steve. They were traveling to Central Florida on vacation and wanted to get in the outdoors. 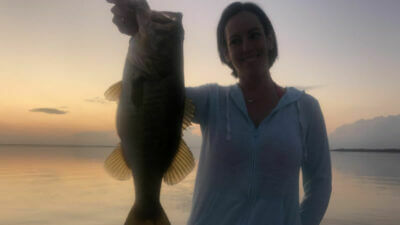 One of the best ways they could think of was a Lake Toho Bass Fishing charter. It was a foggy start for these friends but they still managed to put some quality fish in the boat. Wild caught live shiners were the most effective bait on this fishing trip. 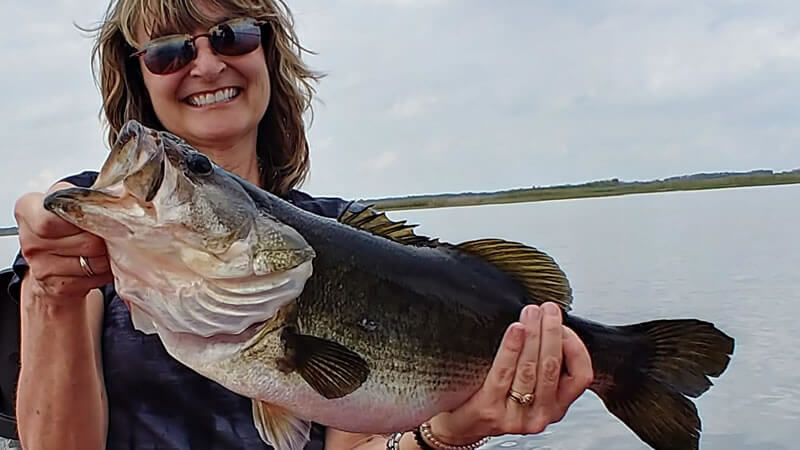 The biggest bass of this fishing trip weighed up to 4 pounds. Phil and Steve will be back for more action in the near future! Captain Brent is looking forward to getting them on the bass again! wanted to experience something unique to Florida. Also, this was going to be the first time she ever went fishing. Sometimes the morning bite isn’t always the best time to catch bass. Wild caught live shiners were yet again a great way to catch all the bass. The larger females came out to play with the biggest fish weighing close to 6 pounds. That is a beautiful bass to catch for the first time and will have you itching for more! Kathryn and Dani will both be back for more action in the near future! Captain Brent is looking to their next adventure in Kissimmee, FL!! Don’t miss out on your fishing adventure in Central Florida. Bass Fishing will be strong all through the upcoming months. Big bass can be caught and it is the perfect time for newcomers to come explore and cash in on the action. If you are looking for a great experience for the family, this is it. We look forward to seeing you on the water next time!